This is a very nice scarf, alpaca and a bit of mohair. I lost the label or, more likely, one of the cats carried it off. It’s about eight feet long. The mid-section is about a foot wider. I just wish it wasn’t blue. 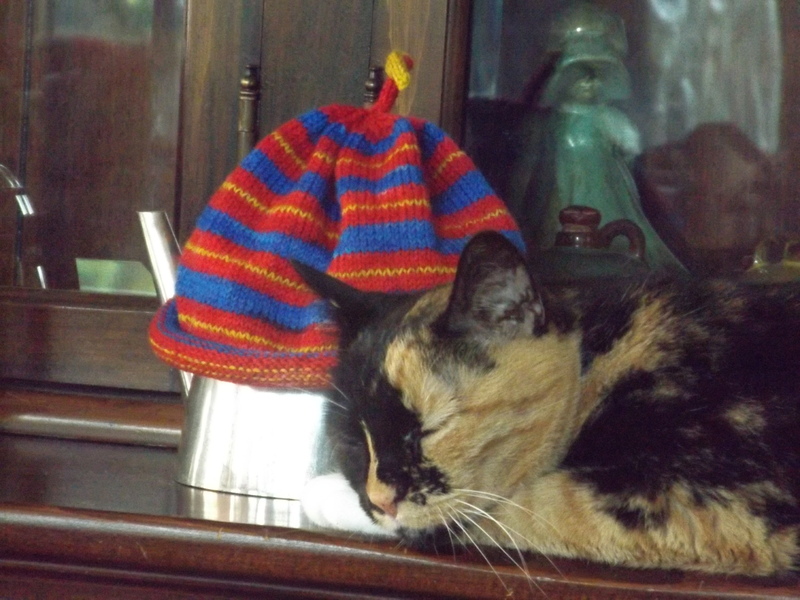 I left it on my glass head for a few months hoping I would warm up to it. Never happened. My daughter said her attendant would like it. She has to stay at the back of the bus which is colder than the front. My daughter drives the school bus for the special needs kids. She says she loves them all, but they can be a real handful. I believe I need to make some gloves before it gets chilly. Notice her eyes are half-open. Also, she had a heck of a time getting up on the buffet. Normally, it’s one perfect lunge with one perfect landing. She is very graceful and she loves to pose. A few weeks ago Sweetums finally finished assembling the patio chairs. 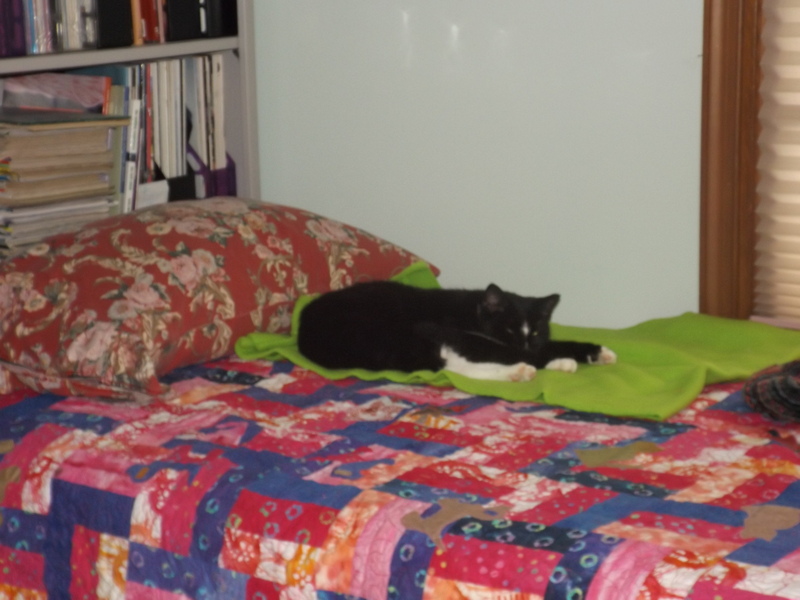 He had left the parts on a pillow on the settle with all the catnip toys. Got that? And now I’ve got one very happy cat. I was trying to take a picture of the hat in Superman colors. It is for my great-nephew who lives farther north. Should I add ear flaps? 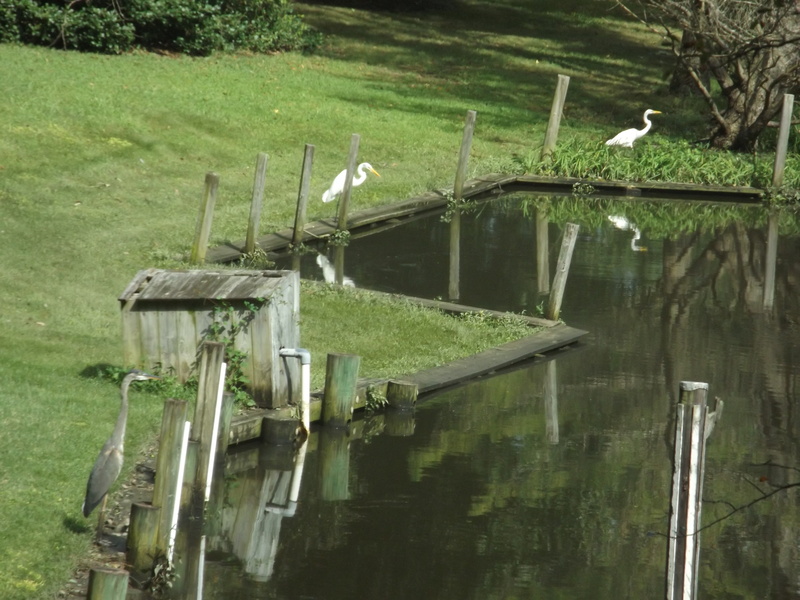 We seem to be getting the hurricane leftovers today. It rains, then sunny and rainy again. Walking and shopping hasn’t been easy either. The boys are having a rough time. 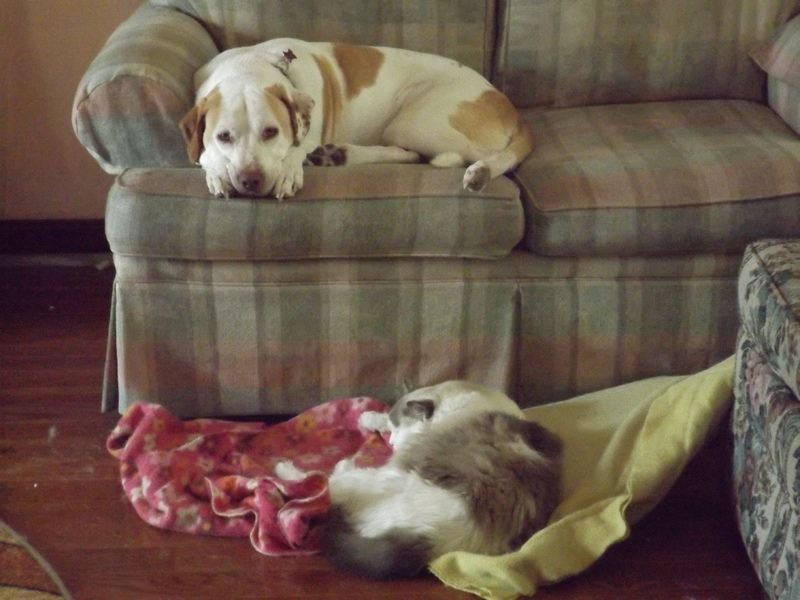 They had to come inside and guess who got the pillow and blanket. Here they are, but I’m not very happy with them. I definitely need some sun and a human. Will I ever tire of it? After one evening, or three to four hours, this is all I managed to finish. Let’s just say I was not happy. 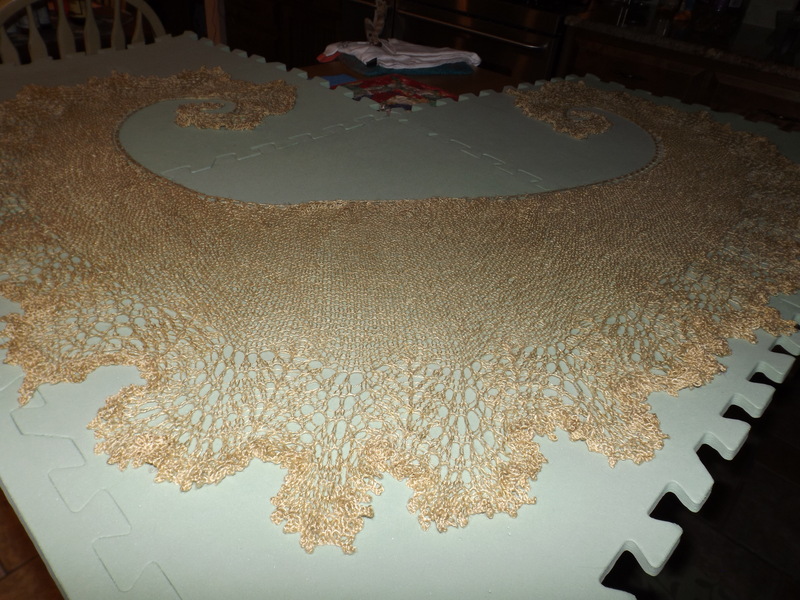 I had over thirteen hundred stitches to bind off. 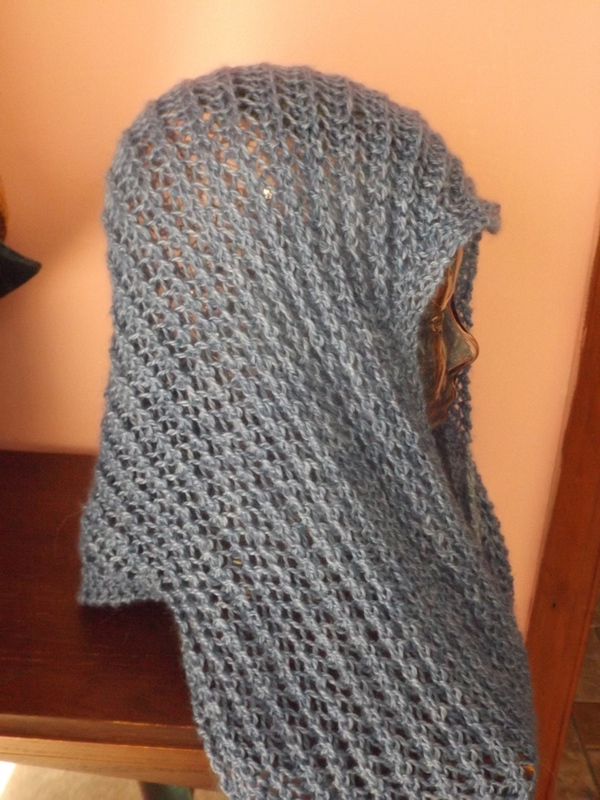 To make matters worse, it is a picot edge. 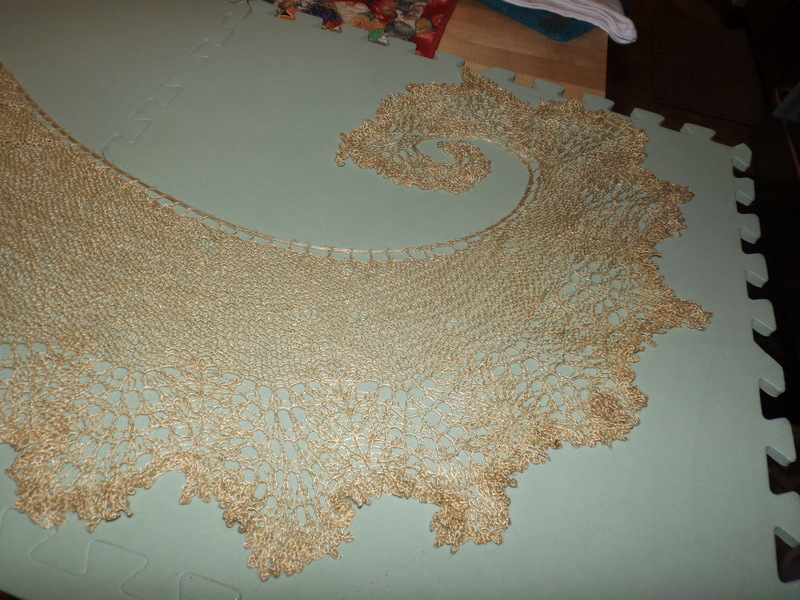 Cast on three and bind off five. And now you know why it took me two weeks. Or was it three? And what else has been going on? Well, not much. Dr. Shoes (I will never be able to pronounce his name) replaced a prescription that I hated. He said it would take three to six weeks to get going and I would be tired and dizzy in the meantime. And he was right. Now, I feel pretty good. I have the best daughter. Saturday, she came down with her fiancé to get my storage/spare bedroom organized. I had wire shelves to assemble and plenty of fabric and accessories to fill them. I had one set of shelves assembled when we first bought this house, but that cup ran over a long time ago. Sweetums had a habit of dumping stuff in there that he never got around to storing properly or throwing away. And I got into the habit of dumping stuff on the bed. There was stuff under pillows, comforters, blankets and a coat rack that I needed. With my bad knees and Sweetums’ bad back, cleaning it out was close to impossible. Enter my well-organized daughter. In five hours, it looked like this. She brought some storage boxes and vacuum bags and Duke’s label maker. I honestly believe she had a good time. Everything is so handy now! I’m so happy! Duke brought along some tools. He fixed the ceiling fan in the living room. I really missed it. It helps move air around when I’m cooking. He also put up a new blind in the storeroom. The old one was pretty ratty. It is so nice to have someone who can do these things. I believe I am really going to like having him around. We called three or four electricians who either said “no” or told us to get a new fan. And the bed is ready for a guest. 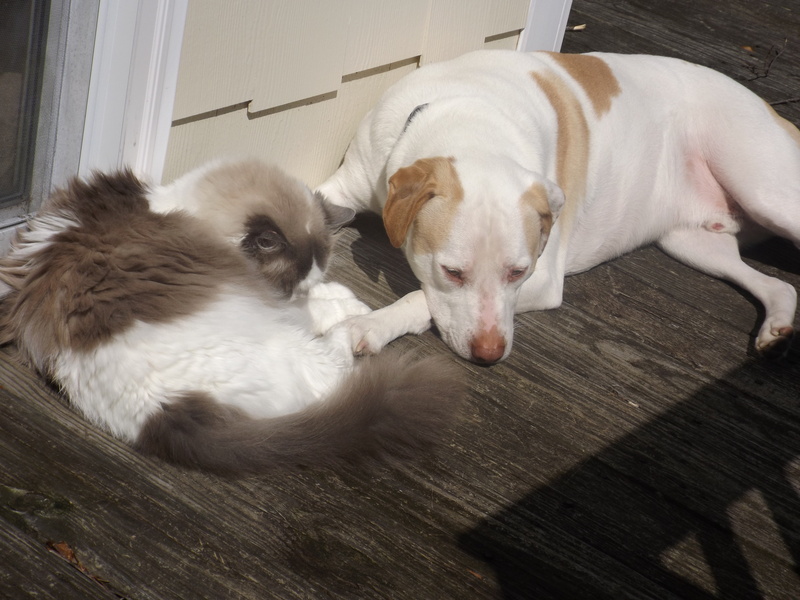 That is if they don’t mind sharing it with Maggie Pi. I don’t go barefoot or sockless. I don’t wear flip-flops and seldom wear sandals. I can’t stand to get sand between my toes. This peninsula is just a big sand pile so I’m screwed. I keep my feet covered which is sad because I love pedicures. Nobody gets to see them and they are pretty. So I make socks. I love these colors. I don’t think I have anything that they won’t match. These are cotton so they are four stitches bigger at the ankle than at the foot. I should be finished with these tomorrow. Next is Jaipur from Katia. It is mercerized cotton. I’ve made socks with it before and I love it. The label says to use size 2-7 which is ridiculous. I’ll use 0 or 00. I used 00’s before and I liked the results. The only trouble is I don’t know where they are, so these may be done on 0’s. I have been wanting to collect all my Alan Dart designs into a binder. I recently found plastic sleeves that are high enough. I guess I should mention that the pages are British and longer than ours. 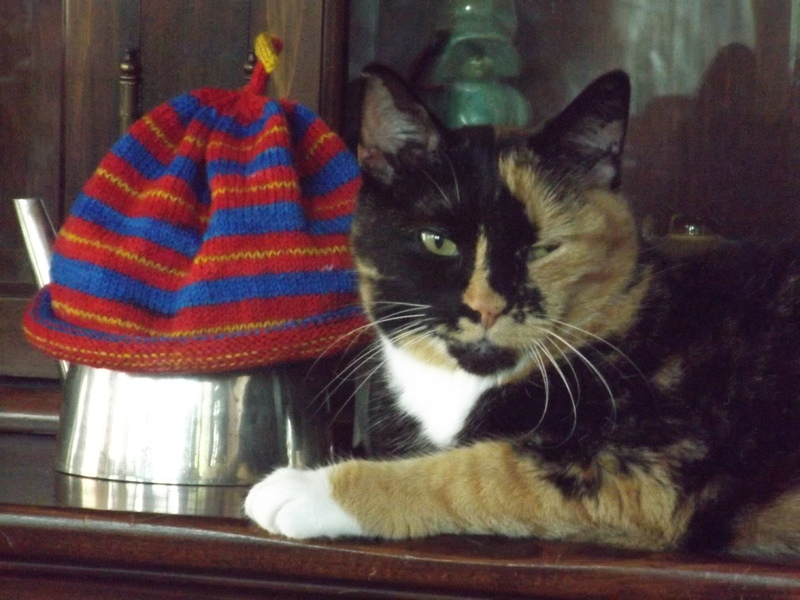 I got out my spiffy little cuter and spent nearly eight hours vandalizing my Simply Knitting magazines. 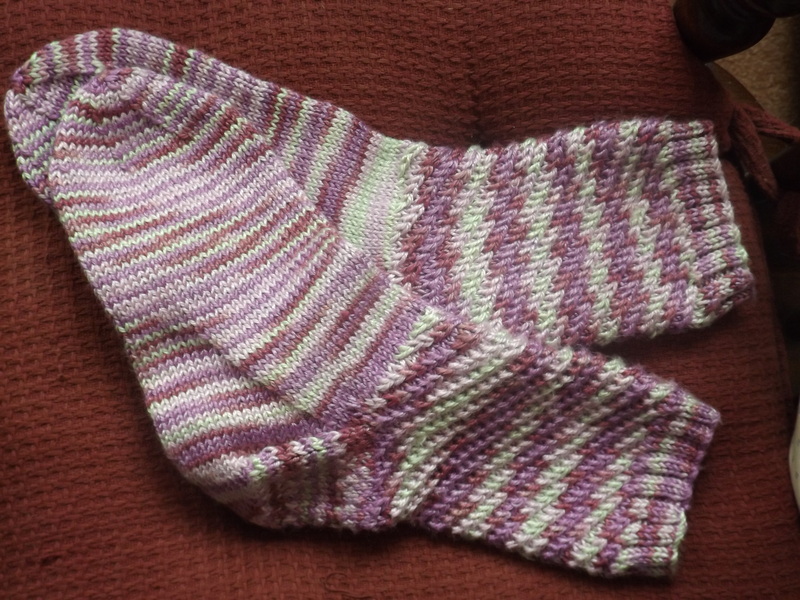 I also removed any other patterns that I thought I might actually knit which was very little. And the magazines went into the paper trash. I wonder what I will get into tomorrow. 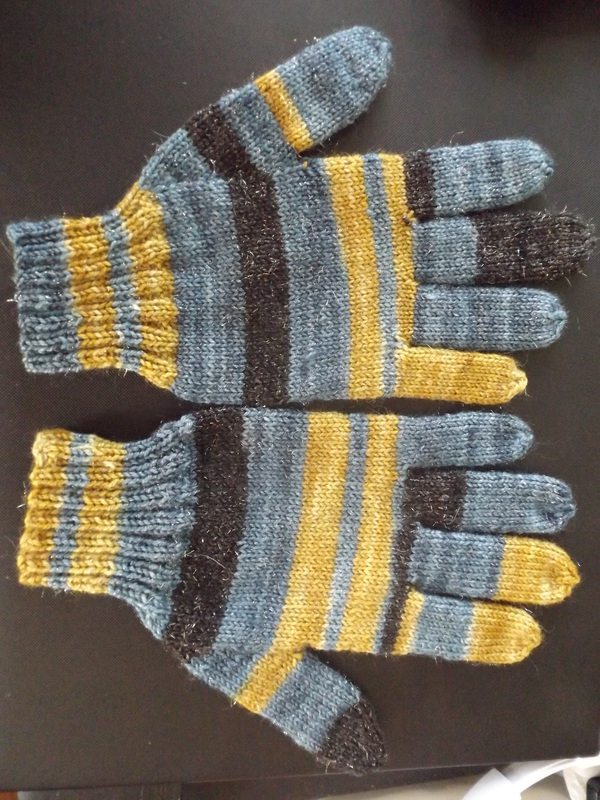 I finished making myself a pair of gloves a couple of evenings ago. 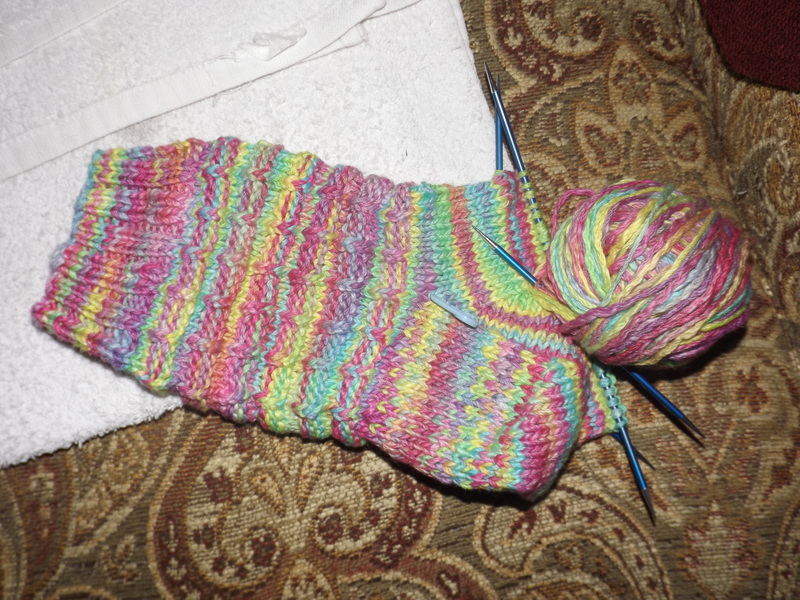 I used a partial skein of sparkly self striping sock yarn. I love to make gloves. It’s the only way that I can get them to fit. Going to PT three times a week is really cutting into my crafting. I know it is good for me and I’m noticing a difference, but I can’t help think, I could have gotten so much accomplished by now. Even though I really can’t stand it, I’ve decided to try organization. 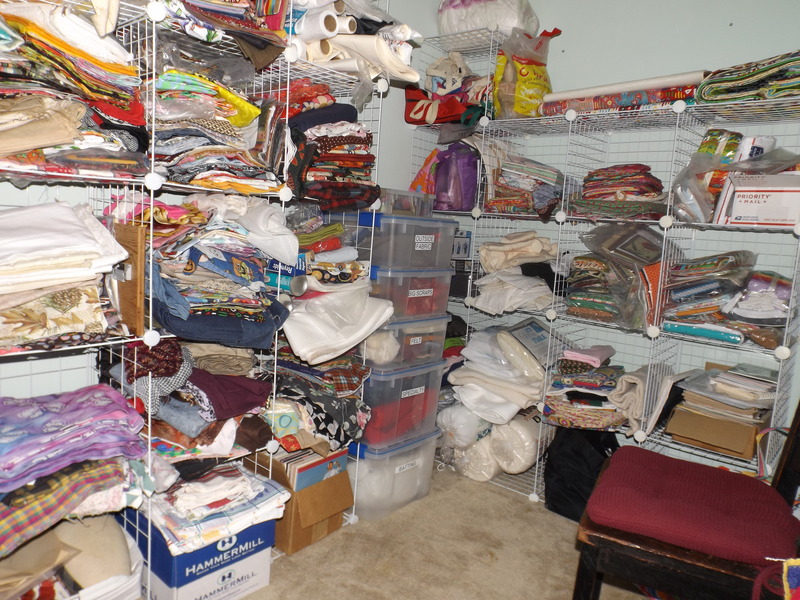 I want a designated space for my serger. 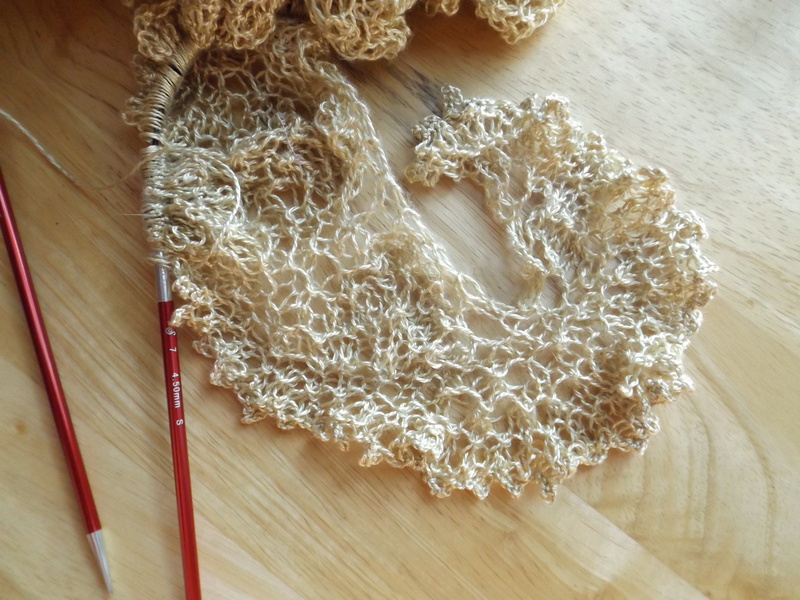 I’ve found some great videos on serging and I am anxious to start. The end of work table #2 would be nice, so that’s where I began. I looked at the yarn that has been piling up. It has gone from bad to worse since MD Sheep & Wool. I got out some handled bags and printed up patterns. Suddenly everything started to fall into place and I’m making some progress. 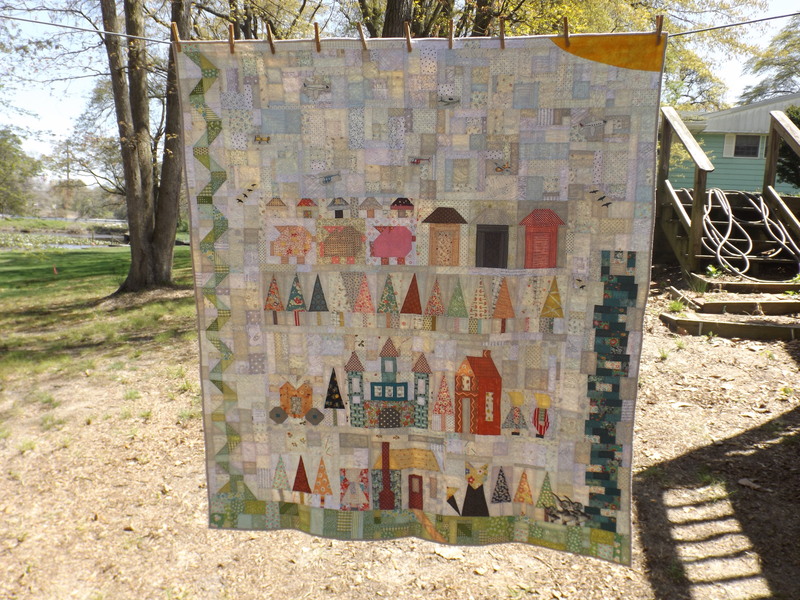 Here is little A’s quilt. It was so much fun to make. I switched a few things and added some birds and planes and elephant family to help to make it personal. And the sun too.